Every time LeBron James makes it to the NBA Finals, there’s always a faction of the NBA fandom trying to make the case that LeBron should be considered the greatest of all time. At which point, longtime basketball fans—who aren’t from Cleveland or Miami—roll their eyes and tell those basketball dilettantes to get on YouTube to watch some clips from the days when real men played real basketball. Getting to the NBA Finals five years in a row—four with Miami and one with Cleveland—and winning two championship titles is definitely an impressive NBA résumé. But Michael Jordan—the person most often evoked in these debates about LeBron’s greatness—won six championships in eight years. Why do we have to keep having this discussion? No matter what LeBron does for the rest of his career, that 2010 TV special where he announced, “I’m gonna take my talents to South Beach” will forever stain his legacy. Not just for the horrible spectacle of it all but also for the idea that he was abandoning Cleveland—which had become his second hometown after Akron and where fans had anointed him King James, Bringer of All Their Championship Dreams—to put together his own dream team (featuring All-Stars Dwyane Wade and Chris Bosh) to win championships in another city. It was a betrayal of the highest order. Instead of building something from nothing in Cleveland—as Jordan did in Chicago or Magic Johnson and Kobe Bryant did at different times in Los Angeles—he decided to take an easier path to the titles, and by doing so, he tarnished his legacy forever. 2. Michael Jordan changed the game. There was a time in the NBA when having a dominant center—one who would inevitably end up in the Hall of Fame—was the only way to build a dynasty. 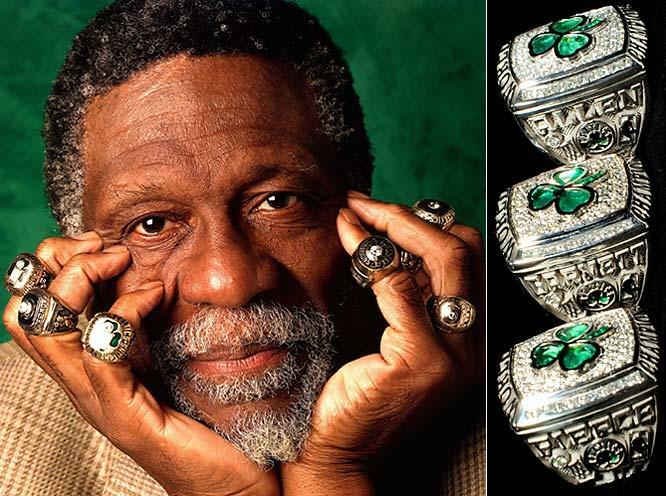 All the greatest teams had one: The Celtics of the ’60s had Bill Russell (who has 11 rings! ); the Showtime Lakers of the ’80s had Kareem Abdul-Jabbar holding it down with Magic Johnson. But Jordan was so dominant, it didn’t matter who the center was on his team. Jordan could have had one of those dudes who wipes the sweat off the floor posting up in the middle and made him into an All-Star. But … quick! Who can name the Bulls’ starting centers for those six championships in the ’90s? (Put your hands down, Chicago.) No disrespect to Bill Cartwright and Luc Longley (OK, maybe just a little bit), but you guys were merely bit players in Jordan’s six-episode championship saga. It took an outsized personality like Shaquille O’Neal to make the center position matter again. LeBron hasn’t had nearly the same impact as Jordan and likely never will. Full disclosure: I am a Lakers fan. But I think even LeBron would agree that he hasn’t even dethroned Kobe as the heir apparent to Jordan, let alone surpassed His Airness as the greatest of all time. Like LeBron, Kobe came directly from high school into the league, and while Kobe didn’t have the same out-of-the-gate success that LeBron had early in his career, Kobe elevated his game to such a degree that NBA pundits were having the same arguments about Kobe vs. Jordan that we’re having about LeBron today. Oh, and Kobe also helped the Lakers win five NBA titles, three more than LeBron (for those who can’t do math). 4. The NBA changed the rules to benefit the offense. Much like the NFL—which changed the rules to make the quarterback untouchable, therefore allowing immobile QBs like Tom Brady and Peyton Manning to stand like statues in the pocket to pick apart defensive secondaries—the NBA has changed the rules in favor of generating points so much so that if defenders even breathe heavy on an offensive player, it’s enough to draw a foul. And while many of these pro-offense rule changes began in the ’90s while Jordan was making his run—which, one could argue, is another way that Jordan helped change the game to make it easier for guys like LeBron—today’s players have elevated making contact with defenders and getting to the free throw line into a fine art. Imagine if LeBron had to take elbows to the ribs from Bill Laimbeer or get smacked around by Dennis Rodman in Detroit on a regular basis. How would he have dealt with getting mugged by Anthony Mason and the Knicks a couple of times a year? He surely wouldn’t have nearly as many points or as many free throws as he does today. 5. That Miami thing was kind of a bust. OK, hear me out: Remember when LeBron rolled into town for that horrible “welcome party” (it was as if they were having a championship celebration in advance!) 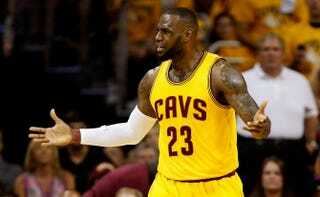 and promised Miami fans that he would bring something, like, seven titles to the city? Well, just as San Antonio and the Dallas Mavericks did the Texas two-step all over LeBron’s dream of bringing multiple rings to Miami, Golden State’s Stephen Curry is looking more and more likely to be the guy who pops Cleveland’s dream bubble, just like he’s been popping threes all over every team he faces. And LeBron will, once again, be denied another chance to take a seat at the greatest-of-all-time table.